At the start of the summer, we sat around and made plans about going somewhere completely different and riding our bikes for a whole week for the fun of it. Somehow someone convinced us Scotland would be not miserable so we headed up there at the start of September. 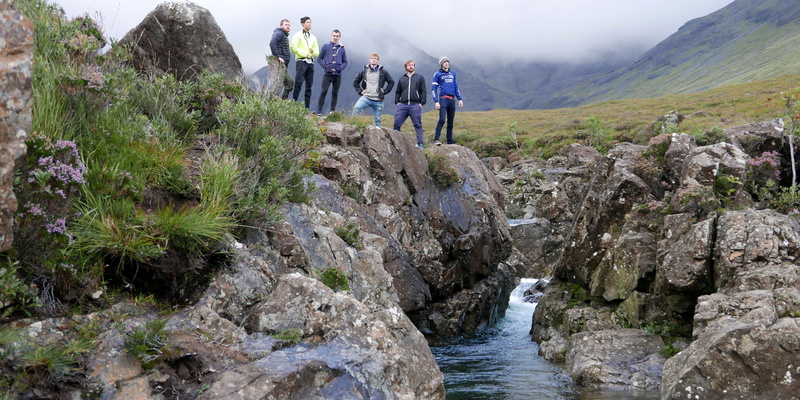 The mastermind himself, Alasdair Morrison, recounts our adventures below. All good holidays start with things going wrong, right? 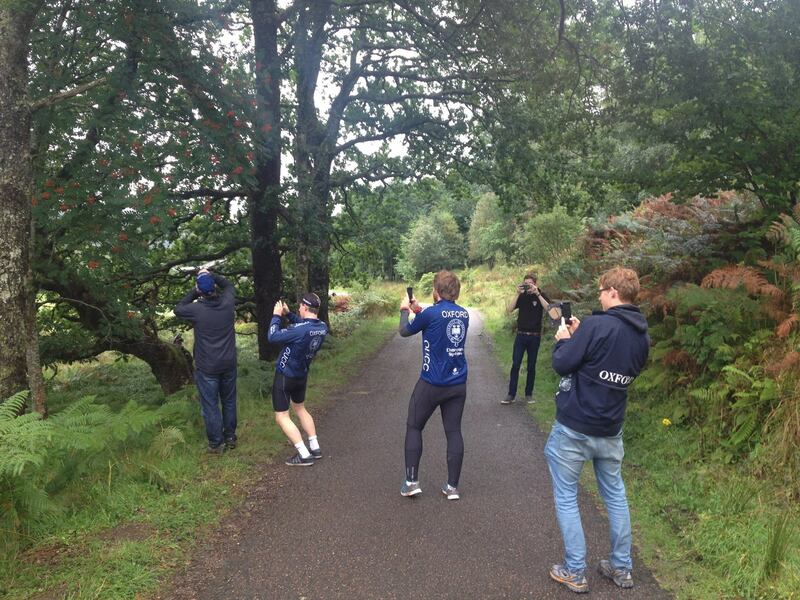 Such was the way of the OUCC NW-Highlands â€œSummerâ€ Tour 2016; with a myriad of drop-outs, extortionate transport prices and the potential for an unprecedented third hatching of midges it was miraculous that anybody decided to come at all. So at 0400 (ish, give 10 minutes or so â€“ I did warn him) on Saturday 3rd September, as I sat revving my gutsy little red Honda Civic outside Angusâ€™s abode I hesitated a glance at who was still coming. Six. Six out of about three-hundred interested parties at the start of the summer. Just six. Angus, David, Matt, Ti, OndÅ™ej and myself. By 0745, Angus and I were tucking into Cumbrian meats at Tebay (the best services ever, have you been there? You should probably go, make a special trip up for lunch or something â€“ itâ€™s only slightly overpriced). A lightly burned coffee, ostensibly a flat white, but more like a tepid, milky burned thing with undertones of bitterness and a terrible future as a short-lived barista did a wonderful job of setting the tone for coffee Beyond-The-Border. By 1115 or so, we had made our way to one of the many feet of the Highlands and were looking at our first chance to unpack our bikes already. tarmac. 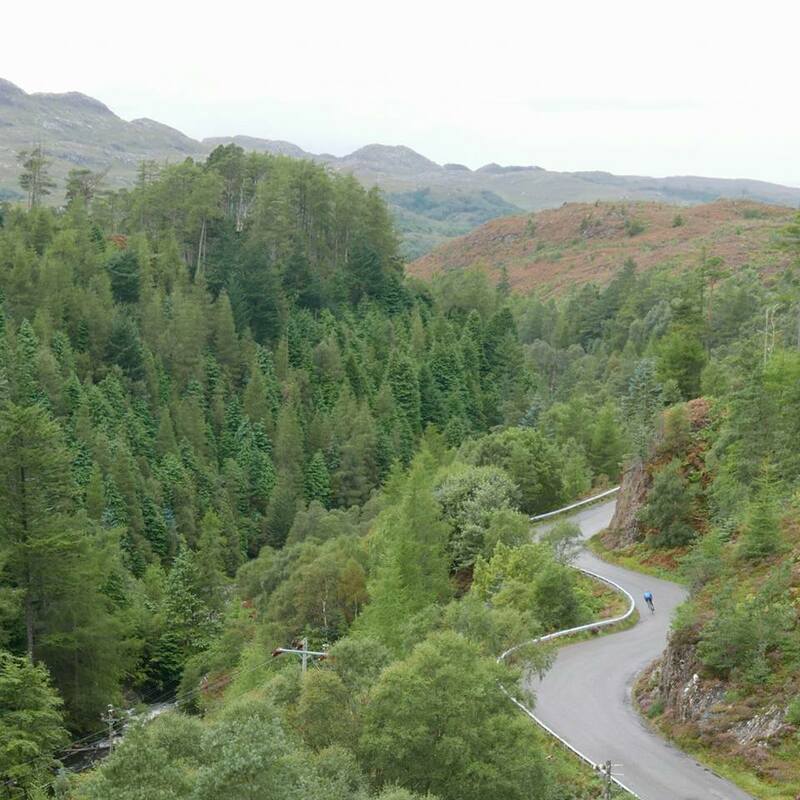 The site of the 2015 Scottish National Hill Climb Championship and my betting on the BUCS course for 2016 which nobody seems to know anything about. Itâ€™s definitely a hill, going uphill for all of its length at a gradient at or approaching very hard â€“ a hard fact toÂ argue about â€“ and it is quite pretty with lots of deciduous trees enveloping it giving a soft warmth to the light in the dank corners and slippery straights. Iâ€™d go ride it if I were you, it is prettyÂ cool. Angus and I, being the advance party of this Beyond-The-Border foray, had a little go at riding it. I suffered slowly up it and called it quits. Angus did some digging about and found a load of lungs to abuse on the way up. After exhausting ourselves and all further opportunities we discovered that the second party of David and Matt were just round the corner and also coming to have a little look-see at the hill. Angus and I wanted lunch so we left them and made our way through the wonderful Trossachs to the start of the proper bit of North we had come to see. Someone once decided to call Fort William the â€œOutdoor Capital of the UKâ€, and itâ€™s a name thatâ€™s only hung around since. Like all capitals (centres of administrative affairs, not sentence leaders), Fort Bill as some idiots affectionately call it is not a place to hang around, as it attracts a sullen greyness that would make even a grey seal cry at the association. So after a short nightâ€™s sleep in a bog-come-campsite (note â€“ some of the clever people chose real beds to sleep in at some of the many fine Scottish Youth Hostels across Scotland) we made hasty tracks across to the West en-route to the fine Glen (valley) of Glenfinnan to look at the â€œHarry Potterâ€ viaduct (actually a very fine example of a poured concrete structure from the late Victorian period) and also to observe the unbelievably phallic monument at the place where the Jacobite risings were initiated and prompted the total decline of Highland Scottish culture and ultimately the end of all things good (probably), (go read up on your history). 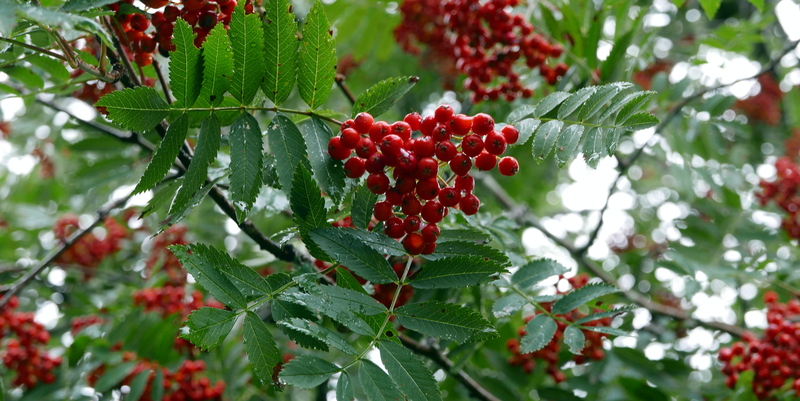 I thought the rowan berries were best â€“ all red and bold and bright against the already drab background of the morning (devoid of good coffee except what I could make come out of an Aeropress with no skill). If youâ€™ve ever been to Scotland in the summer months, youâ€™ll have an idea about the midges. At the start of proper-ride-one, there were a mere handful but they proceeded to make life terribly miserable trying to get bikes sorted and gear on in a layby. With a planned route heading round Moidart and Sunart (famed for their oak forests which are a very particular type of Atlantic oak microclimate temperate rainforest sort of thing â€“ probably damp, midgey and full of ticks) and the potential for afternoon showers and a big hill, I choose a fashionable yet functional outfit of shorts, jersey, armwarmers and Galibier.cc Ultimate Foul Weather Gilet (I think you should buy, one right now). 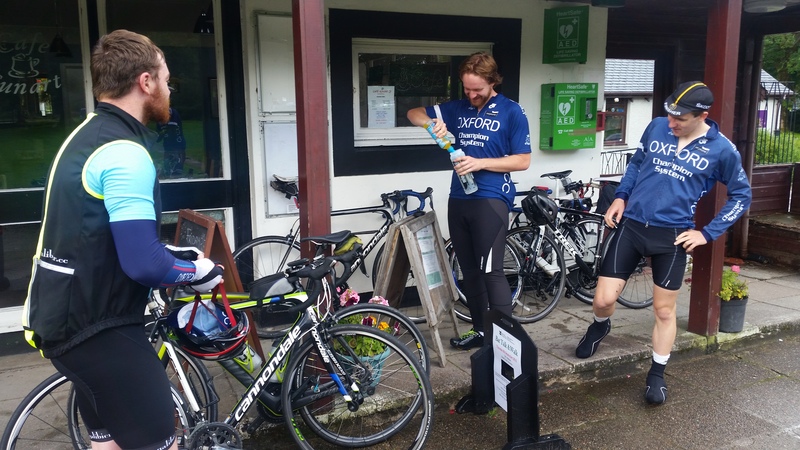 We eventually started doing the cycling thing, once the slow-car had found their belongings, and enjoyed some fine scenery and silly fast descents until we got to the first planned pause stop. Down the ruttiest, roughest road that isnâ€™t a track you could imagine, I dragged five riders all intent on getting some good training miles in, to a little place with a little castle on a little island with a wonderful view. The castle is fourteenth century and the island is tidal, but can be accessed most of the time and itâ€™s just so great â€“ you should probably go have a look. We found a dog and then everyone talked to the dog and I think worked out that this wasnâ€™t going to be much of a specific training camp. The next section or road was so lumpy and I suffered from my hillclimbing exertions of the previous day and dropped off the back. After discovering my speedglasses werenâ€™t on my face which was why I was going so slow, a quick re-application brought them back in to place and I was able to make it to the next stop of a cafÃ© in the fine little town of Strontian (which happens to be the place that gave the name to the element Strontium which was identified in the ore from local lead mines). Being a Sunday, the cafÃ© was obviously closed. I think this is the sort of thing that everyone knows about. CafÃ©s should always be closed at or around the time of day on a Sunday when anybody might consider it a fine early afternoon tea or coffee or sandwich or cake kind of time. For certain. Knocking back the first of many cans of Irn Bru from the attached shop had the desired effect and spirits were raised enough to continue the road. The majority of us elected to take the shortcut that avoided the 272 m of climbing up to some place of no importance, but Angus and David chose the extra 20 km and declared it good. 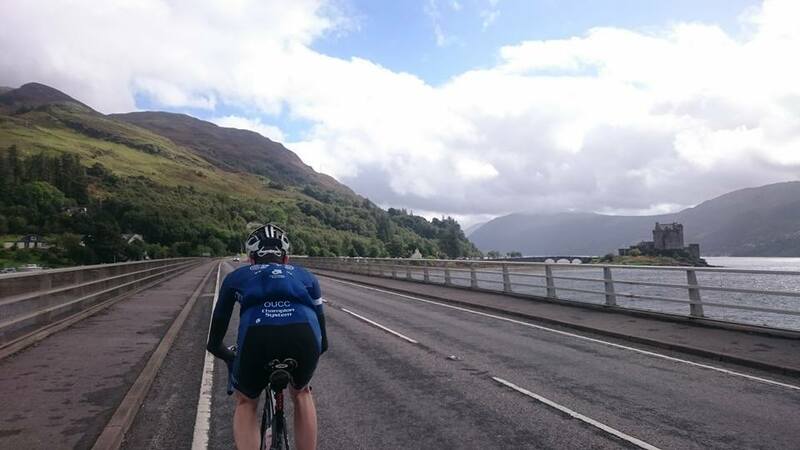 The shortcut was good too, and then we had almost two hours of tailwinds and sunshine up Loch Linnhe (which has a ferry crossing it at one of the narrows which is my middle name namesake so must be pretty wicked) and Loch Eil. Eventually though, the rain came, it was wet, terribly wet. After the rain we had to go on the main road (which was very quiet, generally well surfaced and had stunning views), the primary benefit of which was finding a cafÃ© that was open and served filter coffee that didnâ€™t quite taste like the bitter end of the weekend. The road went up hill some and then just as the exciting cornery downhill bit came, so did the next rain and there was no visibility. But we made it back to the cars after a fantastically good ride, probably too long to call an opener, but not so long as to be not functioning. 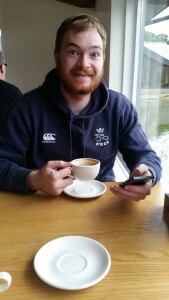 How good was the gilet, I hear you ask? So good, go buy one. That evening was supposed to see us taking the nearby ferry over to Skye, so as we watched a ferry leaving at bang-on 1800 with our arrival at the dock and everything looking suspiciously dead in the surrounding locale, it soon dawned on us that we may have just missed the last ferry of the day. Sunday, right? A quick chat with a young dockhand confirmed this by way of identifying that the next ferry was at seven oâ€™clock, but not that evening, get me? What to do? Fish and chips. 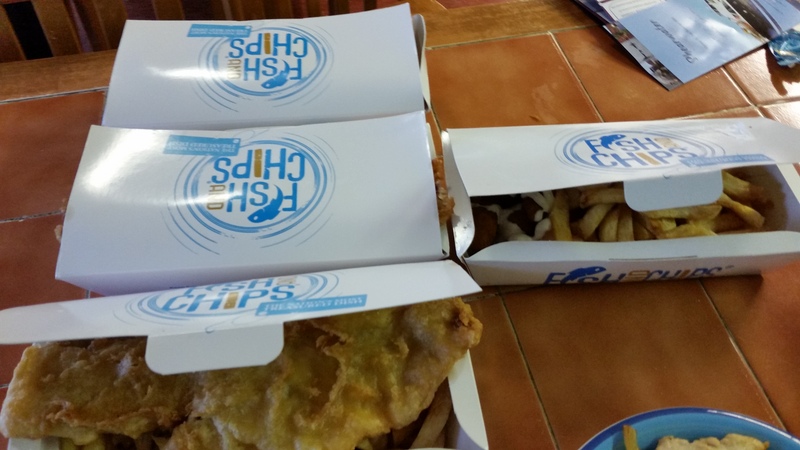 Now I can confirm that there is a little fish and chip shop in the port town, Mallaig, and that it definitely serves the best fish and chips Iâ€™ve ever had. They also make and sell some of the best salmon pate in the world too. Obviously though, nobody wants fish and chips at 1815 (by now) on a Sunday evening. So we end up getting takeaway fish and chips from a not terrible, but not really good cafÃ© down the road (their lobster looked exemplary, but I bet the coffee is instant). 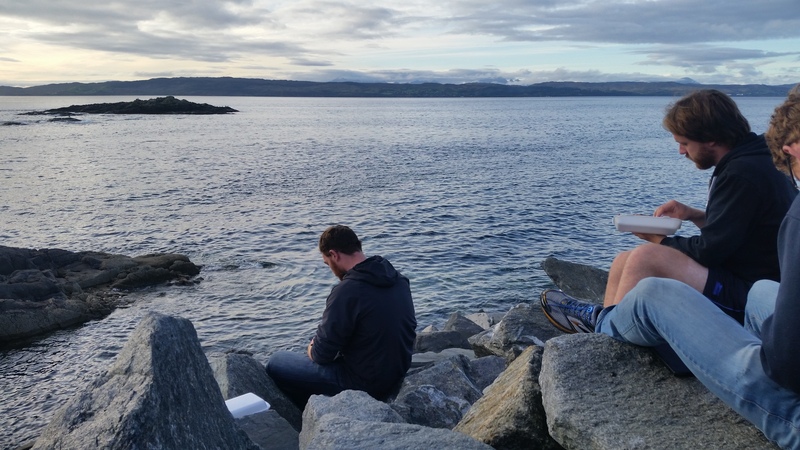 The view is great and really brings out the flavours of the fish. But this doesnâ€™t really hide the looming four hour drive to get to the pre-booked youth hostel and the planned campsite. Nothing Irn Bru canâ€™t sort though. Our arrival at the campsite is marked by two notable incidents at around midnight. Firstly, somebody cruelly shining their car lights on a tent for just a little too long which provoked a course northern accent with some even courser words to emit (a bit like magic, really). 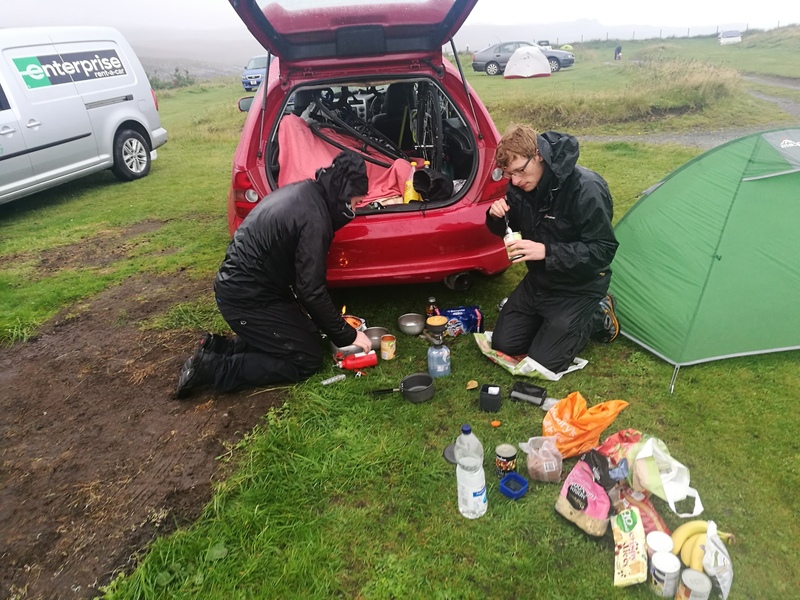 The second notable incident was the discovery from the slow car that the tent that had been slept in just 17 hours earlier was not there, and was now probably sitting on a rather boggy piece of grass all stowed nicely in its back some three hoursâ€™ drive away. Oops. Monday is never a good day. This was especially not a good Monday. Having spent a surprising amount of the night with my tent trying to hug me, the morning dawned with plenty of typical horizontal Scottish rain (itâ€™s a local speciality, you should go try it, very fine, elicits some wonderful responses from otherwise civilised people). Not a good day to ride. Camping looks like fun …. After much discussion and a coffee from a man in a sort of shed some 9 miles from the nearest village (apparently good enough coffee bit but not really a flat white despite the assurances) where there just happens to be some good mountains to climb (Glenbrittle, voted one of the best campsites in the UK by The Guardian â€“ you should go), it was decided that we should start the planned route from somewhere up the road where it wasnâ€™t quite raining so horizontally. 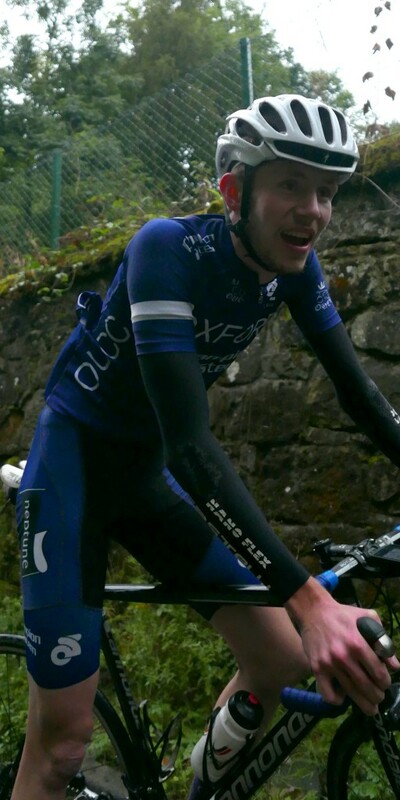 I chose Bracadale, to give a 90 km loop which would be plenty on a wet windy day. 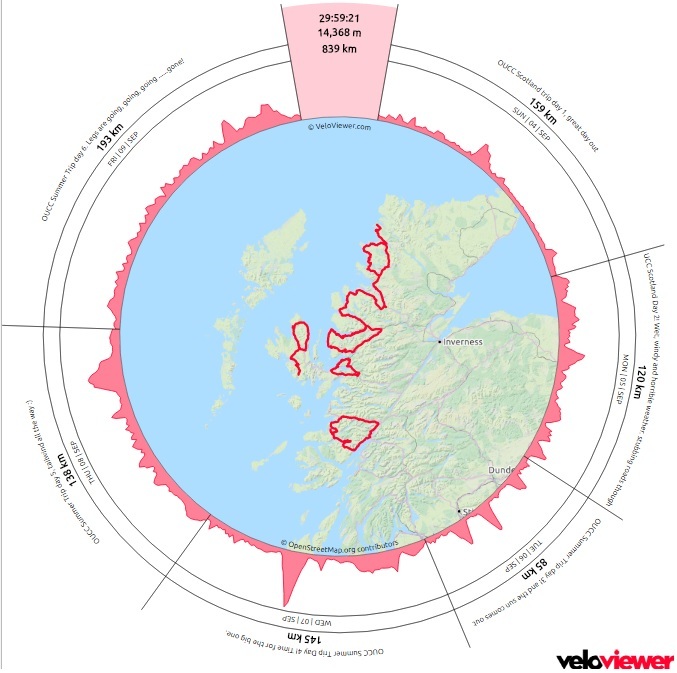 The ride around the Trotternish region of Skye is regarded as hanging around the 35th best cycling ride in the UK (thatâ€™s a fact). The views are amazing, and it passes some fantastic geology. This day was not like that. With the first hour and a half amazingly easy, something was amiss. There were no views, but maintaining 50 kmh plus on the flat was well achievable. I turned around early citing knee complaints and then spent the next hour and a bit travelling the 18 km back to the nearest coffee place (burned, scalding and with weird froth). Everyone else had a wonderful time scaling the Quirang (probably the best climb ever) and then enduring the same headwind back. After four hours of rain, Angus and David still hadnâ€™t had enough and wanted to ride the extra 32 km back to the hostel (into the wind). I think they had a really nice suffer in the gloom. By the time we caught them up, they were only a few km away from the end, so I was able to provide a bit of motorpacing, gaining great pleasure in making it really hard for them. Like really hard. The wind and rain then promptly eased and the rest of the evening was quite delightful. Two hard rides, one easy ride, two hard rides, one easy ride or so the adage goes. 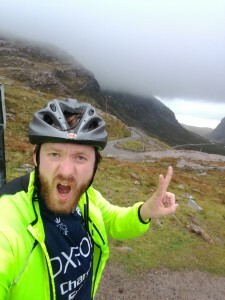 I thoughtfully planned a gentle 85 km ride to enjoy on the drive to the next hostel/campsite (Torridon) to take in some castles, some bridges and a ferry. After a morning potter up to the fairy pools (an easy family outing for the summer for children describes The Guardian), a quick pose as the new boy band for 2016 and some thoughtful photos of water, rowan berries and heather, we headed over to the Tallisker distillery (Â£8 entry nowadays, no thanks) and enjoyed the smell of the maltings (maybe) and whatever else they prepare in those funny white buildings (make mash and stuff? ).Â A last stop at a reasonable sized shop (probably needed porridge oats all round, and some Irn Bru) and then we were in Plockton to get started. Plockton is a town that is held in high-regard by people describing themselves as â€œartistsâ€, so much so, that the National Trust for Scotland seem to have bought up the whole area to stop it being developed on. As a direct consequence of this, the place is excruciatingly pretty. The start of our ride took us on the finest single-track road so far. Sweeping through the trees on an immaculate surface with occasional glimpses to the sea below and over to the horrific climb due for proper-ride-four. This was relatively short lived and ended with a climb that went on forever through conifers with no view at a perfectly constant gradient to the top of nowhere really. 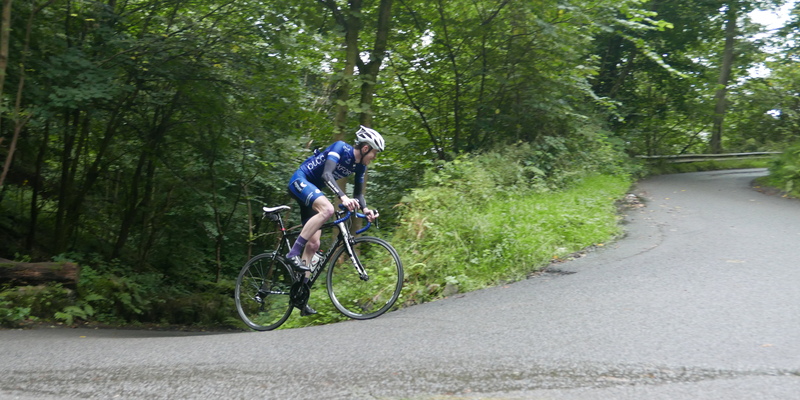 161 m of climbing to the top of a nothing hill. Heading down the other side, I used my mass to accelerate to near warp speed and hold off all late chargers. My turn on the front completed for the day we were then spat out on to another main road (hard to avoid this far north) and after sitting in a traffic jam (roadworks, ugh) we then had a good thirty minutes of very high quality through and off to the foot of the Mam Ratagan (a hill). Basking in glorious sunshine, and zipping past Eilean Donan (a castle, on an island, restored), we made rapid progress. At the turn for the hill, I entered my reserves of steady hill climbing mode and sat back, aware of what was ahead having driven over on previous occasions. Others without this knowledge were treated to a display of the finest in military road building with a steady and almost sneaky increase in the gradient all the way to the top (343 m ascent, 4.3 km, 8% average). The final pitches of the hill being so very punishing, each of us were in our own little worlds. Zipping up my Ultimate Foul Weather Gilet over the top of the climb, I mentally prepared myself with a little snack for the alpine-like descent on immaculate tarmac (again â€“ probably EU funded). What a descent. You should probably go do it. Itâ€™s that good (thatâ€™s a fact). 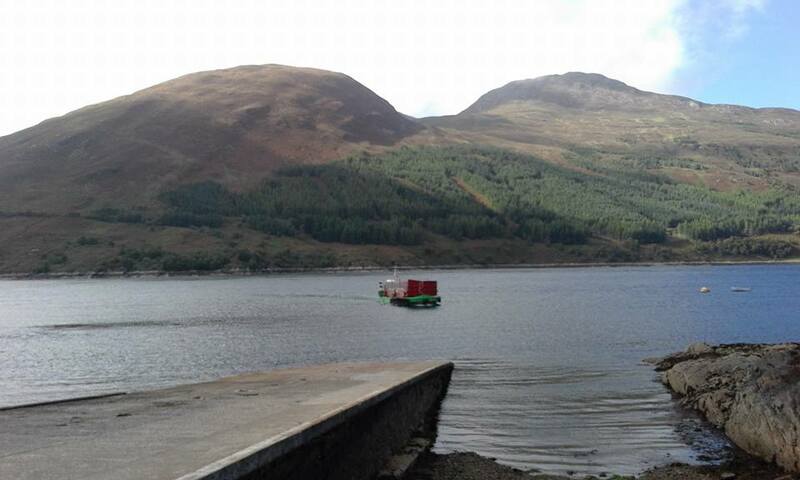 The bottom of the hill saw us erupt into the calmness of Glenelg, and more sunshine, and more sea. A quick trip up the road took us to the original ferry to Skye and the last hand-operated turntable ferry in the world. Basically the ferry arrives, and a stout man with a core like a tightly wound harp proceeds to rotate this large metal platform allowing cars (up to six, and bikes) to access the ferry even though it pulls up alongside a slipway. Once the cars (up to six, and bikes) are loaded, this little pincushion man of explosive force rapidly whips the turntable back in line with the axis of the ferry and off it goes (you have to see it, you should go). The other side of the Kyle Rhea (literally current narrows) is another climb. So once you disembark from the little spinny ferry after crabbing its way across the narrows itâ€™s ready to get the legs going straight away. 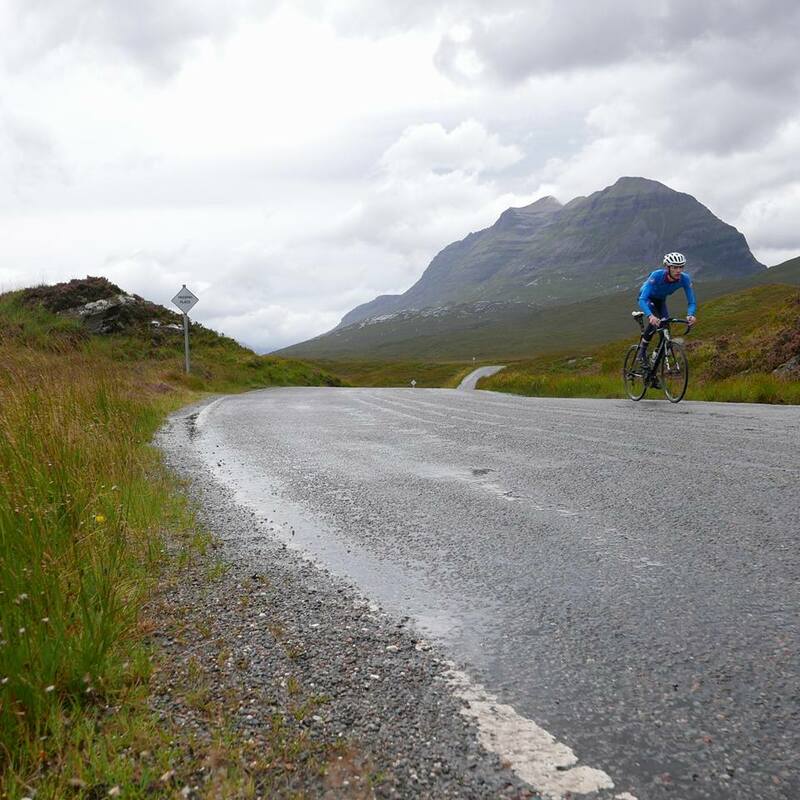 The Bealach Udale (pass of the goodness-knows-what) is not so bad (277 m ascent, 3.8 km, 7% average), but has the alarming feature of putting the steepest bits at the end again and also making sure you can see them from most of the way up. Pretty cruel. The descent was on rough, narrow singletrack and was built like a rollercoaster, dipping and diving all over the shop. So fun. I gather only Matt came a cropper without actually hitting the deck, so top job all round on a wild ride. From the base it was only a quick spin back to the cars, so naturally it was quite fast. Heading down the main road single file and hell-bent on tailwind speed we hurtled onto the Skye Bridge at many kmh, and I called a leadout. Mashing a gear so big I thought I might end up with a fine, creamy-consistency potato based substance in my drive-chain I hauled big watts all the way up the steep and Angus and David hopped off me on to the tail of a minibus to claim the KOM for the whole bridge. Top job. A quick pootle along the gorgeous roads to Plockton and a good recovery ride completed. Probably not much recovery. That evening saw us walking a full 25-minutes to a pub to get some recovery food and not have to cook it in the midge-laden bog of a campsite. I had a Venison burger and it was so very, very fine. The waitress was also very nice, and not at all disgruntled to actually have to serve people things. Not even slightly. I wonâ€™t tell you where this pub was, â€˜cause I donâ€™t think you should go. But the Venison burger was tasty. The decision had been made to do the ride planned for the next day (a big one, with a very big climb in it) the following day on account of the recovery ride not containing recovery. But a quick glance at the weather showed this to be an ill-advised plan. Up-to-date weather information is somewhat of a miracle these days, arriving at your phone as and when you call it up. Apparently though, my service provider doesnâ€™t believe in Scotland and as a result I donâ€™t receive much weather information. In a place like Scotland this can lead to all kind of rash decisions. Like planning to go sunbathing on Friday morning, but getting to Friday from Thursday may take you by means of a sizeable storm followed by two days of drizzle. Four on the trot is a bit like a horse, they need four legs to trot, but cycling isnâ€™t really like trotting at all. 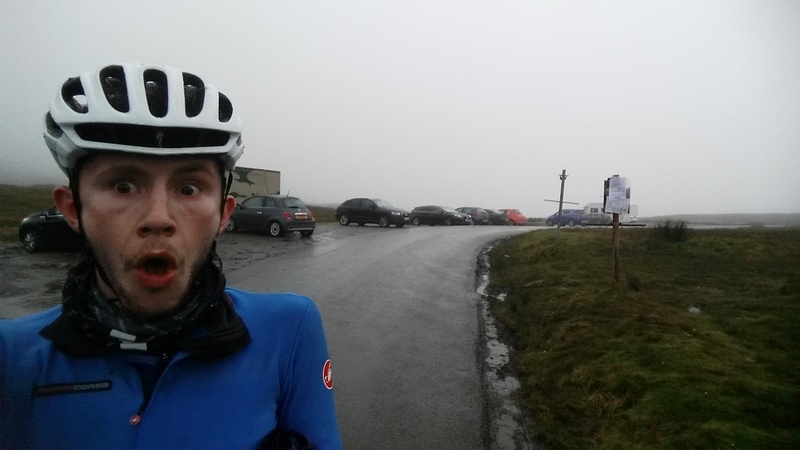 And so it was in the drizzle that we set-off for what was to be the second biggest ride of the holiday/tour/training camp/sufferfest/whatever-it-had-now-become. The ride headed north from Torridon past the heaving bulks of Liathach and Beinn Eighe â€“ two of the finest mountains in Scotland (thatâ€™s a fact). Well worth a trip, you should go. 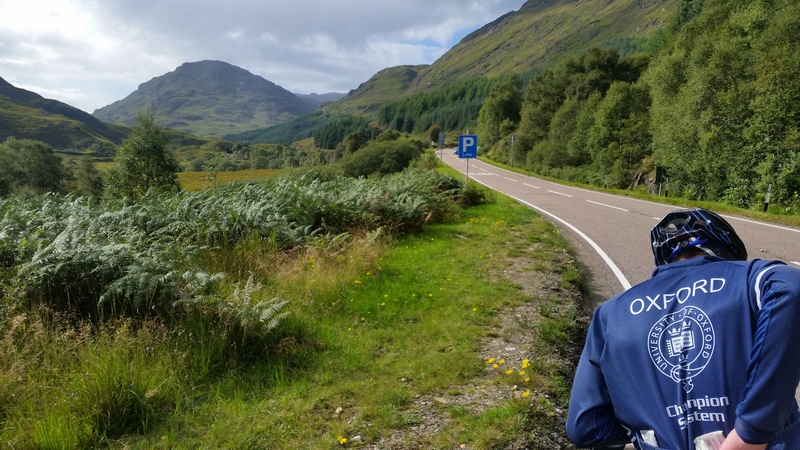 And then looped back south through Strathcarron (like a glen, but flatter at the bottom) and then over to Applecross by means of the Bealach nÃ¡ Ba (pass of the cattle) and then along the not-very-flat coastal road back to Shieldaig (coffee stop) and Torridon. I really think you ought to just go and cycle up here already. If youâ€™ve read this far, then you may as well invest the time to go there. I set-off early to get a softer start in and warm the legs up. Thinking I had months to wait, I paused at a tiny wee cafÃ© and asked for an espresso. I was told to sit down, I indicated I wanted to take it away, I was told to sit down and await someone to take my order. Bit of a faff. By the time my order was taken, I spotted four helmets nip past the window outside and not take note of my clearly well-parked and highly obvious bike. So I cancelled my order and got-the-hell-outta-there (coffee probably would have been crap). It took me a solid long time of chasing to finally catch the guys ahead. This chase was uphill all the way. 6.6 km of uphill chasing. Into a headwind. I donâ€™t do uphill. I only barely do headwinds. I had to do threshold for almost twenty minutes to catch back on. But catch on I did, and then after a short downhill and the first and only roundabout of the day we were heading down Strathcarron with a storming tailwind. So commenced 30 km of 38 kmh easy riding. Top job. This ended with a village with a shop, which equalled an Irn Bru in the drizzle. Top job two. Now, being a bit of a wimp when it comes to hills, I had some idea of what the following 50 km would be like in terms of hills. So, I opted for the shortcut. Never one to miss a shortcut me. Unzipping my Ultimate Foul Weather Gilet on the way up a slight rise, this was enough hill for me. 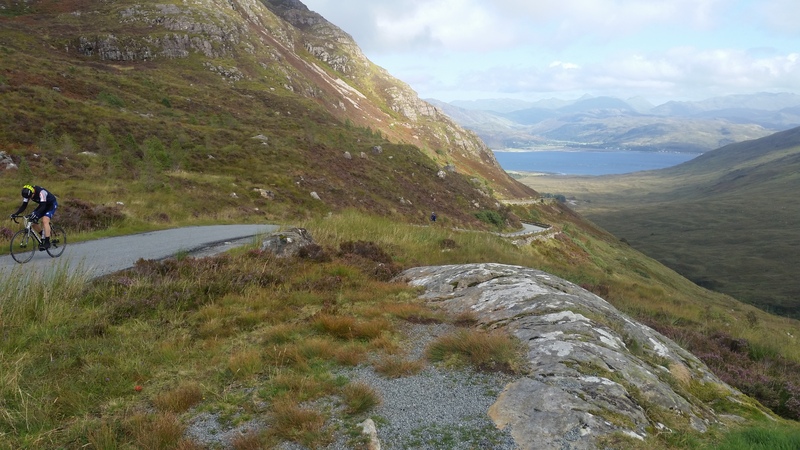 Iâ€™d leave theÂ Bealach nÃ¡ Ba to those who really could enjoy it (627 m ascent, 9.3 km, 7% average) and especially the steep section toÂ the top (315 m ascent, 3.1 km, 10% average). Not for me. 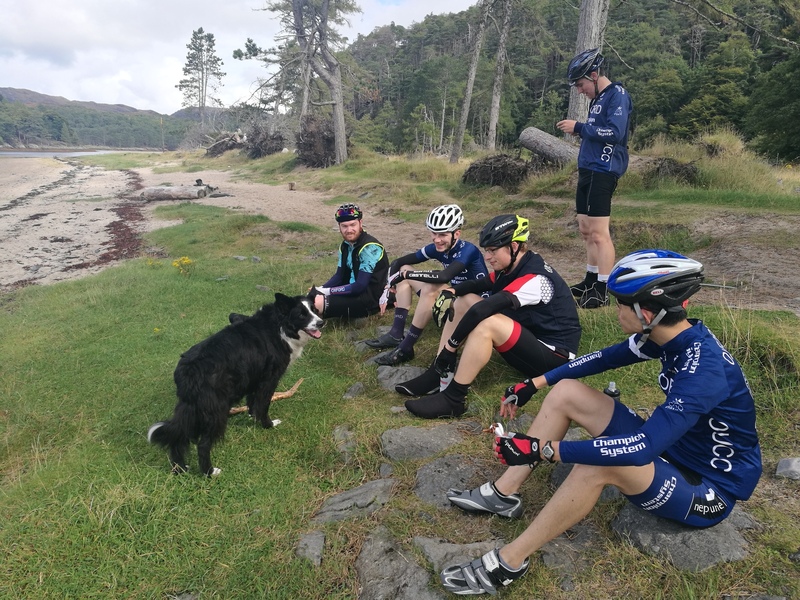 I went with Matt to Nannyâ€™s in the next village (Shieldaig) and I had two coffees, and spoke to some track cyclists Iâ€™d met once before (sprinters, thighs so big I canâ€™t even begin to comprehend). WhilstÂ we enjoyed coffee (first one burned, second one not too bad) the others covered an additional 41 km with some 1700 m of climbing. Pretty hilly. Glad I went the gentle way. I gather that the up andover was spectacular all round and that you should probably go do this too. I will one day. 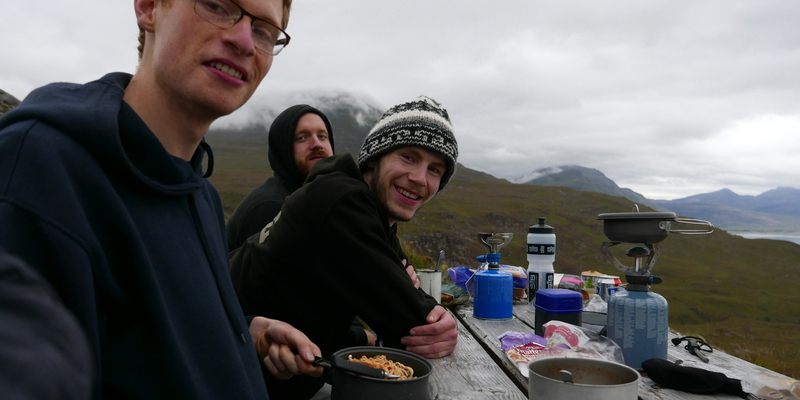 Evening dinner was attempted at a viewpoint away from the midges, and only had a little bit of drizzle in it. I had noodles and sausages. 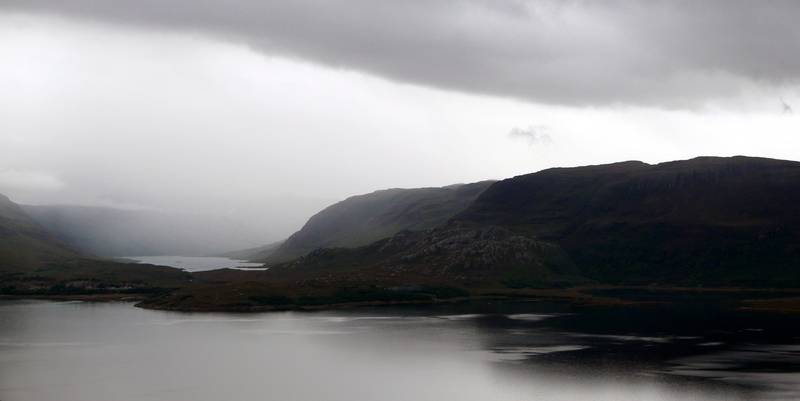 The following day a transfer had to be made to Ullapool, a fishing village/town/capital of the northwest highlands. 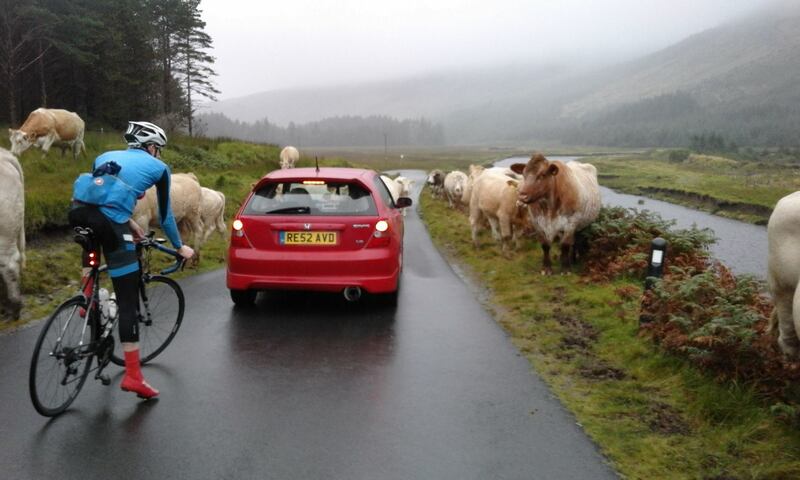 This meant letting the keen beans go cycling as they pleased whilst I drove the car and tried to take some pictures. The landscape was so large and overwhelming it was nearly impossible. You really ought to just go up and have a look you know? The keen-beans can probably tell you how good the ride was. 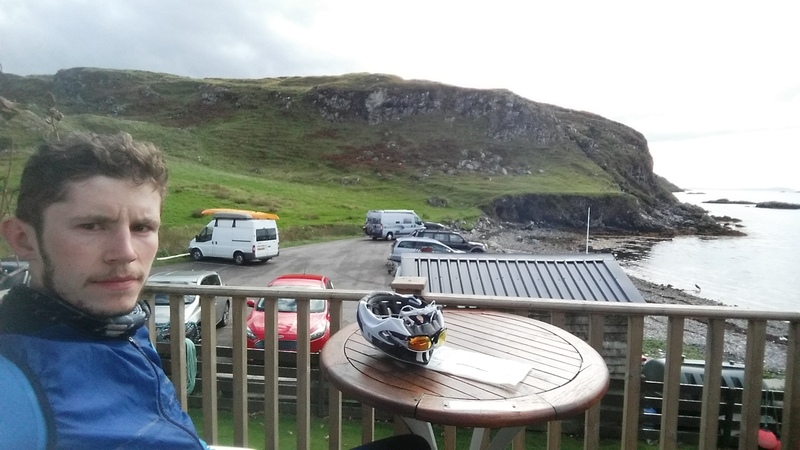 We stopped for a coffee in Gairloch. Lovely cafÃ©, terrible coffee. Ullapool is a strange but pleasant town. Despite only having about five streets, it has two banks, a dock, a ferry port, a Tesco, two fish and chip shops, a large campsite and more than enough pubs for its 1500 inhabitants. So into this heady mix of modern excitements we were drawn, like turtle doves to Maltese shotguns. Luckily, fish and chips and maybe a cider/beer or two where the only things that we indulged ourselves in. In preparation of the next dayâ€™s potential for 190-something kms with 3700 m of climbing, an early night was required. When you look at a profile thatâ€™s mostly near sea-level, itâ€™s very hard to estimate how the climbs will really be. So it was. 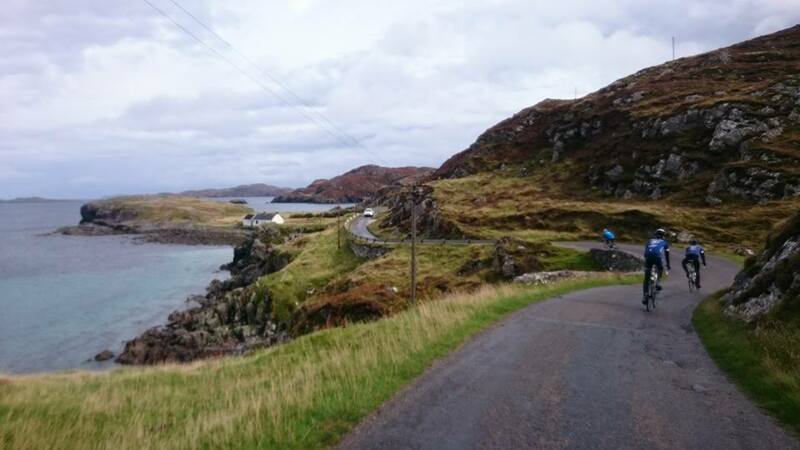 The loop round the region of Assynt has a long coastal road, famed for its secluded sandy beaches hemmed in with rocks as jagged as a you like and crystal clear waters of turquoise and green. We chose this. Mostly because there were no other roads to choose. The shortest loop I could make on a map was over 110 km. The next shortest 145 km. On to this I stuck a ratâ€™s tail of misery up to some village I wasnâ€™t even sure had anything to see. Good route planning. 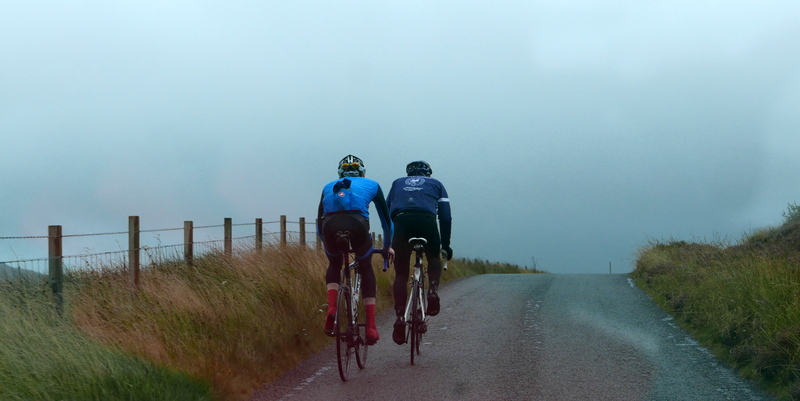 The day loomed pretty grey, given the length to ride and amount of climbing involved an 0800 start was called for. We set off about 0830, not bad. With a storm due to arrive at 1600 with gales and rain it would be wise to be back by about then. The first lumps were easily dismissed and we moved into the sparce mountain scenery of the far north west. Stac Pollaidh (stack polly), Suilven and other shapely mountains provide scenery you wouldnâ€™t really believe in. Like extras with free time in a Star Wars set we cycled through this weird and lurid landscape to the coast road start proper. With ups and downs coming thick and fast and weaving our way through hemmed in valleys, past lochans (small lochs) and over rivers thick with the peaty-brown waters that are so tasty. In no-time at all (actually a good couple of hours) we reached the first and only real destination on our route and stopped for some hard-earned coffee (cafetiere, very good) and bacon rolls/salmon treats/cake and what not. Within moments an hour had passed and a thick, drenching shower had caught up with us. Five minutes hesitation was enough and we hardened up and went out. Instant shivering. The coastal road is hilly (I think Iâ€™ve mentioned that) and pretty (possibly mentioned that too), and so in no time of the shower easing, we were warm and happy and tailwind propelled once again. The next couple of hours are pretty blurred. 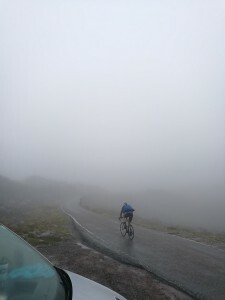 But I remember my Ultimate Foul Weather Gilet keeping me plenty warm whatever happened. There were definitely some climbs that were so steep you were barely moving, followed by descents with even more steepness such that you couldnâ€™t stop moving. Twists and turns, loops and humps. Like the badly piloted plane you can simulate in Google Earth the terrain kept us well busy and well engaged. Only too suddenly (thatâ€™s a lie â€“ I was wishing the road would stop by then) spitting us out at the main road (not very busy, again, lovely gradients). Ti and I went down to the old ferry slip and watched the fish swimming under our feet. David and Angus went out as keen beans and did the silly hilly rats tail to the north, heading high over our location on a bridge we couldnâ€™t see. The return from this now quite northerly point was hard work with a good old headwind and the open road making it feel very slow. 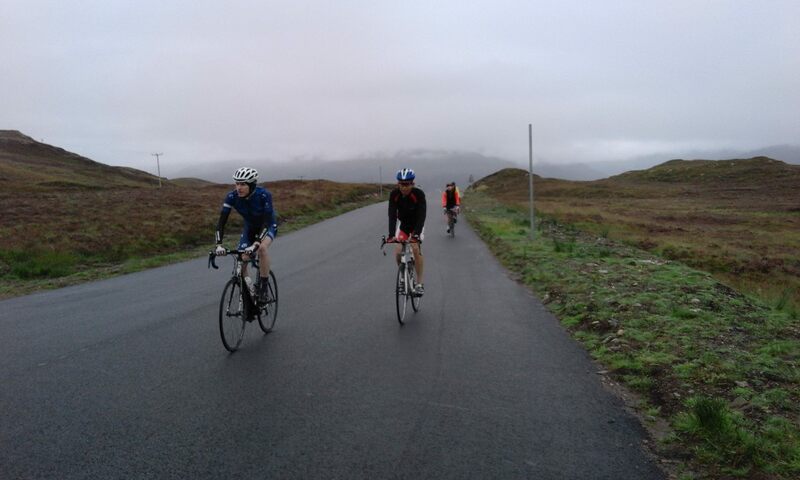 But we progressed steadily and clambered over several high passes to get back into Ullapool just before the aforementioned gales and rain arrived. The keen beans sounded like they had a much, much harder time all round. With a beer, and fish and chips, in the hostel, we concluded our trip to the north. Iâ€™ll be going back. But you should go too, and if you do make sure you take an Ultimate Foul Weather Gilet. The weather can be pretty spectacular. When you go, I recommend you take an espresso machine. Youâ€™ll need it.